Woodbury, MN, August 23, 2017 – The East Metro Symphony Orchestra (EMSO) is pleased to announce violinist Joan Molloy as it’s concertmaster. Molloy served as guest concertmaster for A Celebration of Finnish Music, the final concert in the orchestra’s 2016-2017 concert season, and returns as a permanent replacement for Michal Sobieski, EMSO’s previous concertmaster, who retired last year. “I am happy to have been invited to work with EMSO and am looking forward to an exciting year together,” Molloy says. 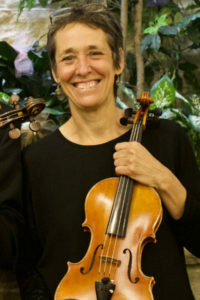 Molloy will begin her tenure as EMSO’s concertmaster with the first concert of the upcoming season, A Mighty Fortress, which will present Mendelssohn’s Reformation Symphony at King of Kings Lutheran Church in Woodbury on October 29th.